1. Bring a large pan of salted water to the boil and cook the spaghetti until al dente. 2. Meanwhile, in a small bowl blender blitz the peas, chilli, garlic, basil infused olive oil, lemon juice and Parmigiano Reggiano. Season generously and spoon into a large serving bowl. 3. Drain the cooked spaghetti reserving a little of the cooking water and toss into the pesto, adding a little of the water to loosen the sauce so the spaghetti is evenly coated. 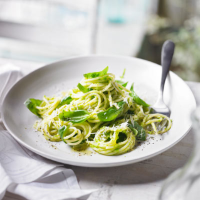 Serve in bowls and top with extra shavings of Parmigiano Reggiano and torn basil leaves.